Because who doesn't love shrimp? Especially when each delicious crustacean has just 19 calories and a single gram of fat? Peel and devein 60 medium to large shrimp. In a big bowl, mix together the zest of 2 oranges and 2 limes, 1/2 cup of olive oil, 3 tablespoons of chopped fresh basil, a teaspoon of kosher salt, and 1/2 teaspoon of black pepper. Toss in the shrimp and stir them to coat. Pop them in the fridge for a half hour, then fish out the shrimp, and discard the marinade. Grill the shrimp over medium heat for about 2 minutes on each side, until they're slightly charred and fully opaque. Mmmmm. Shrimp. These spicy jalapeños with a creamy, tangy filling will keep your guests awake and on their toes. Cook 2 thick slices of bacon until they're crisp, drain the grease, crumble them up, and toss them in a bowl. Add 4 ounces each of soft cream cheese and soft fat-free cream cheese, 1/4 cup of shredded sharp cheddar cheese, 1/4 cup of minced green onions, a minced garlic clove, 1/4 teaspoon of kosher salt, and a teaspoon of fresh lime juice. Halve 14 jalapeños lengthwise and remove the seeds. Divide the cheese mixture among the jalapeños. Spray the grill with cooking spray, and grill the jalapeños for about 8 minutes or until the bottoms are slightly charred and the cheesy filling is slightly brown. Garnish with chopped cilantro and a smattering of chopped seeded tomato. Each jalapeño half contains a paltry 56 calories, 4 grams of fat, 2 grams of carbs, and 3 grams of protein. Bite-sized tomatoes provide the fresh, the goat cheese adds the creamy, and the olives turn it all tangy. Your guests won't be able to get enough of these tasty all-in-one snacks. Trim a teeny bit of flesh off the bottoms of 24 cherry tomatoes to keep them from rolling around, and slice the top 1/4 inch off to reveal the innards. Scoop out said innards with a small knife. Mash together 3 ounces of goat cheese, a tablespoon of milk, 2 tablespoons of green olives, finely chopped, and 1/8 teaspoon of black pepper. Fill each tomato with the mixture, and sprinkle with finely chopped oregano or basil. How easy is that? Each bite contains a mere 14 calories and a gram each of fat, carbs, and protein. 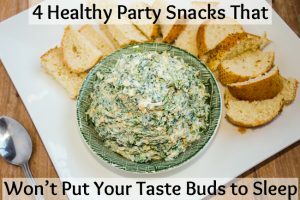 What kind of party would it be without an artichoke dip of some sort? Gotta have the artichoke dip. Heat a tablespoon of oil over medium heat and cook 1-1/2 cups of chopped onion for about 5 minutes. Add 3 cloves of chopped garlic and cook another 4 minutes or until the onions are slightly golden in color. Let this concoction cool. Combine in your food processor bowl a 9-ounce package of defrosted, drained, and dried artichoke hearts, a 10-ounce package of defrosted chopped spinach with the liquid squeezed out, 1/2 cup each of sour cream, Neufchatel cheese, and mozzarella cheese, 2 tablespoons of mayonnaise, 1/2 teaspoon salt, and 1/4 teaspoon of fresh black pepper. Process until smooth. Add the onion mixture and pulse a couple of times to mix it in. Scoop the dip into a square glass baking dish or glass pie plate and bake for 15 to 20 minutes. Serve the dip with a couple of your favorite cracker varieties. Each 1/4-cup serving has 75 calories, 4 grams each of fat and carbs, and 6 grams of protein. Which one are you going to try? ?